No longer for the fabric installation, power trouble, to prevent leakage of outdoor wire and other security risks, just installed, open the switch can be used. Undecorated simple style, always bring people in the simple and elegant design, addicted to the eternal classic. This useful fence light will be really useful in any garden. No wiring is required! 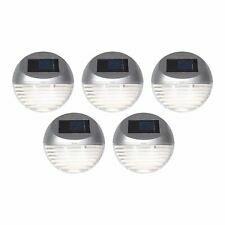 Below are the features for5PK Solar LED Fence Light Silver. Uses 2 warm white LED’s per light. 1, Safer and more protected. Set of 3 assorted Coloured crystal ball solar light. Made from durable stainless steel and strong plastic ground stake. These magical solar light balls are a sure way to add a fantastic touch to your garden or patio. Cole & Bright Solar Droplet Stargazer Hanging Light Create a stunning visual display outdoors with the Stargazer Droplet solar LED hanging light, proving that pendants don’t need to be restricted to indoors. Solar hanging lantern with blue shade Creates a decorative holographic 3D lighting shooting star effect when lit Integrated solar panel allows this to be placed anywhere in direct sunlight Will stay lit for up to 8 hours once fully charged Size: Overall Height – 530mm Shade – H 130 x Dia 110mm PLEASE NOTE: Shorter periods of daylight may mean this product does not charge enough to achieve the desired brightness or work for the duration required. LED SOLAR SPOTLIGHT. Total luminous flux approx. 340 Im; colour temperature (light colour) approx. Separate solar panel with an approx. 4.75m connection cable for optimal site selection. Motion sensor with adjustable range up to max 12m. Features: This outdoor solar lantern is eco-friendly. It's unique design can be placed on any kind of ground. Built-in solar panel avoids messy wires. The sensor detects surrounding light and will turn on and off automatically. It takes 8 hours to get fully charged under the sunlight. Description: You can also use a AA nimh battery to light up the Owl when necessary.. Creates a warm ambience to your garden wall of fence. Solar Butterfly Wall Art. Solar powered. Ultra bright LED lights. With White LED light. If we discover an error in the price of goods you have ordered we will inform you as soon as possible and give you the option of reconfirming your order at the correct price or cancelling it. Garden Fire Torch style Paraffin Lantern from Harbour Housewares. Sleek Stainless Steel construction gives a contemporary twist to the classic Tiki Torch design. With the torch standing vertical, press down on the wind cover and twist anti-clockwise to remove (along with wick). Sleek Stainless Steel construction gives a contemporary twist to the classic Tiki Torch design. Filling Your Garden Fire Torch. With the torch standing vertical, press down on the wind cover and twist anti-clockwise to remove (along with wick). 20 SMD LED Solar PIR Sensor Light. Lamp Garden External Use No Wiring Required. Powerful 5.5V 0.57W solar panel. Weatherproof to IP65 - suitable for exposed external use. No wiring is required. This fun, fabulous feathered friend makes the perfect, quirky addition to your outdoor space. A unique addition to your garden. Channel Islands, Isle of Man, Isle of Scilly, Isle of Wight, Scottish Isles, Scottish Highlands and N.Ireland, Republic of Ireland. Kingfisher Solar Crackle Glass Ball Light. Perfect for illuminating pathways and borders. Contains bright white LEDs. Solar powered – automatically lights up from dusk till dawn. Stainless steel with crackle glass globe. Feature: - 100% Brand new and high quality; - Solar collectors gather energy during the day and automatically - Auto illuminate at nigh or darkness area and off in days time; - Distinctive, textured glass design; - Decorate and illuminate for gardens, pathways, lawn, ice cubes, floor etc; Specifications: - Material:Glass Plastic; - Solar panel:Polysilicon 2V 100mA ; - Rechargeable Battery: NI-MH AAA 600mAh; - Water proof level: IP65; - 1PC 0.06W LED;. Crafted with high-quality material, the set is designed for both indoors and outdoors. 100 individual LEDs, with Approx 10cm distance by each, making the string light less intense and more pleasant for the eyes. Usage: Fuel Wick. Material: Fiberglass. Fuel Absorption: Fully Stable. Long lasting. Features:100% brand new and high qualityConsists of 96 LEDs, each LED flickers warm yellow lights,dozens of change of flame,mimic extremely realistic & natural dancing flames.Waterproof, No Strobe Lights, No RadiationCreating the romantic feel of a flickering flame for your party,barbecue,camping.Making these the perfect addition to poolside,backyards,patios or any outdoor environment.Transform your yard into a tropical paradise.Product Properties:Solar panel: 0.88W, 17% of effeciencyLi-ion battery: 2200mAhLED: 3528*96PCSLumens: 35lmLED Span life: 50,000HrsSolor charging time: 8HrsAuto identification of day or light: light controlProtection function: over charging, overdischarging.Over current, Short circuitLi-ion battery span life:500 circlesSolor panel. We upgraded 4LED to 6LED, now the lights are bright than before. It is far brighter than other similar lights on the market. 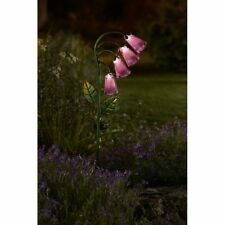 Great outdoor light for your garden,ackyard,Path，aisle,Gutter，Wall Moun，Fence，porch, patio Path, or driveway etc. Solar Cell Type: Ni-MH. 1X Landscape Lamp. The garden is full of joy by animal decoration. Light Source: LED Bulbs. Due to the different display and different light, the picture may not reflect the actual color of the item. Can be used as a table top or stake light. Solar Powered: Yes. Made of Solid steel with an xl ground spike for sturdy balance. EASY TO INSTALL - No complicated wiring is involved. Just place the solar light into your garden, lawn or flower pot turn the switch to on and you are ready to go! Solar powered stainless steel bollard design stakelight. Automatically illuminates at night. Ideal for marking paths and driveways.